I have always made art as a means of relaxation, I find I can lose myself in what I’m doing and really enjoy making all the decisions that lead me to a finished piece. I studied 3-D design glass with ceramics at University many years ago and following that had a long career in adult social care. During my career I continued to paint at weekends and built up a large portfolio of work which I began selling last year. I was pretty successful immediately and sold many small pieces at very reasonable rates. It was really encouraging to find people who wanted to buy my work, so I took the plunge and left my job in November and since then I’ve been selling online and at markets pretty consistently. 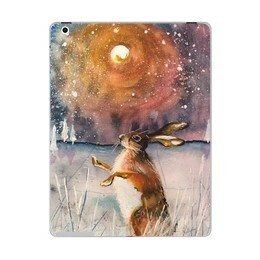 I love the ‘staring hare 2’ artwork as well as all of the other ‘hare’ artwork. Can you tell me a little more about this design and what inspired it perhaps? I read a lot and when I paint I listen to audiobooks. I prefer the spoken word to music whilst I’m working and stories can bring vivid images to your mind as a reader. Watership down is one of my all time favourite novels and the characters of the rabbits and other animals have such strength and determination. 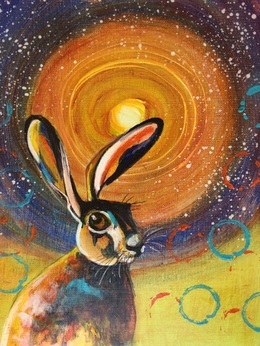 Staring hare 2 along with many other hare and rabbit pictures, was produced in the spring of 2016 when I was considering my options about going full time as a painter. 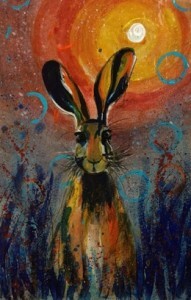 I put it on a social group on Facebook and another artist asked to buy it, that made my mind up. 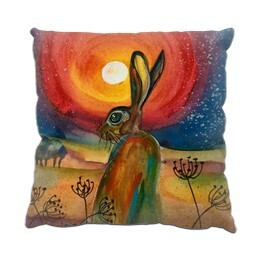 I love Hares and the mystery, magic and mythology that surrounds them. They endure against all odds and are amazing to watch in the wild. They can often be seen in the Northumbrian countryside and it was in the Ingram valley that I saw my first one. This particular picture is full of character and a bit of defiance, which I think I was feeling at the time – also he seems just a bit caught in the headlights and disorientated probably because of the decision I was making. 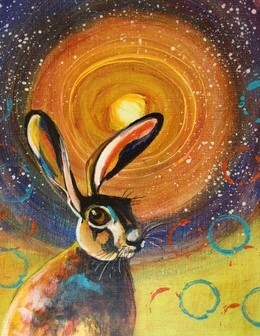 I call him fiver as he reminds me of the seer rabbit who was the first to know what the rabbits of watership down had to do. I love oil paint, however I’m often frustrated by drying times and the space required to keep bigger pieces whilst waiting for each layer to be dry enough to work with. I often will begin by sketching out with watercolours; sometimes this can end up as a finished piece. The bigger pieces I make will often be mixed media, sometimes beginning with texture like leaves, glue, string, sculpture paste etc with acrylic overlay for quickness then finished with layers of oil paint and varnish. I really like to let the medium direct the piece to completion – it makes every painting exciting as I don’t know where the medium will take me. 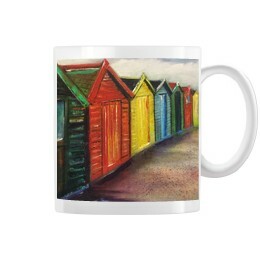 Your designs are quite picturesque and feature a lovely blend of colours. 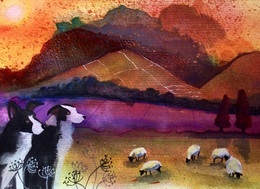 Do you have a particular scenery you like to work with or favourite colour combination? If yes, why is this your favourite? 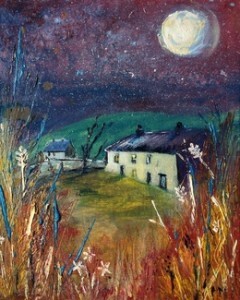 I do often return to country cottage scenes with lush gardens or set in beautiful countryside. When I was little all of my drawings were either gymnastics orientated or my ideal home, usually a huge mansion with a conservatory and an observatory and very formal gardens. I think I probably paint houses now because of that which are based on ones I’ve been to or my own home which is small (a bit quaint but with all I need ) with a large unruly garden. I think the cottages have quite human characteristics, they are usually alone but the sun or moon shines on them – I don’t know what that says about me. I do love colour though and I want to make art that makes people happy – working in adult social care for so long means that I understand the value of home and simple pleasures. I want people to experience happiness, peace and joy when they look at my art. When I paint an animal they’re not cute, but they are vivid and alive with all the joy and challenge that being alive means. 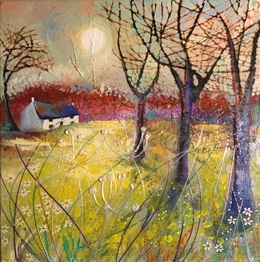 I like many modern painters such as Julie Dunbar and Deborah Phillips, I find Scottish artists inspiring and strive to give my practice an identity with where I live and where I come from. I think that gives the work an authenticity and integrity. I was born in Cumbria and have always lived in the north of England mostly the north east. Northern artists I admire are Norman Cornish and James Downie. Of the greats, Frida Khalo and Vincent Van Gogh for their fresh naivety and Klimt and Kathe Kollowitz for their studies of humanity. 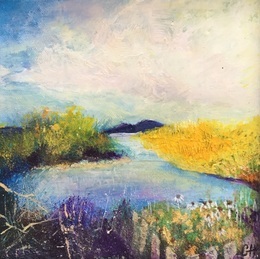 I always love the last piece I made the most, and treasure it for the time that I have it – I’ve trained myself to let pieces go now but I’ve kept lots of my larger pieces, mostly pictures of my home and garden. Has art always been your main outlet of creativity, or has there been anything else you have found that allows you to express yourself in an alternative way? I love to cook and I’m constantly finding new recipes to try. I also write poetry and short stories occasionally which I sometimes share on my blog. Despite this, I’m clearer visually when I try to express myself so concentrate on painting mostly. I have learned to be brave, if you don’t put stuff out there you will be constantly frustrated. Also to take praise and criticism in the same way – not everyone will like what you do and some will like the things you don’t think are your best work. Trust your instincts and stick to your guns – if you have a unique style stick with it and hone your skills, individuality helps to get you noticed. Most importantly, make sure to schedule time to create and time to be inspired – it’s easy to lose yourself in marketing, accounting, networking etc and it’s important to make sure you have time and space to create. I would love to work with an author and produce illustrations for books. For now I’m happy dancing to my own tune making what I want and meeting other people who’ve taken the same route. I would also like to paint people more and I’m working up to that. I’m on pretty much on all this social networks Facebook, Instagram, Etsy, Tumblr, and Ebay. It’s really important to have an ‘easy to find’ Internet presence. It helps give confidence to potential and existing customers. They can see you as a recognised artist and they know where they can find you easily. Also as an independent operator it’s good to be part of social networks that you can reach out to from your workspace. It’s easy to become isolated as someone who works from home. It’s really good to share experiences and get advice and support from your colleagues in the art community and online is an easy way of doing that.